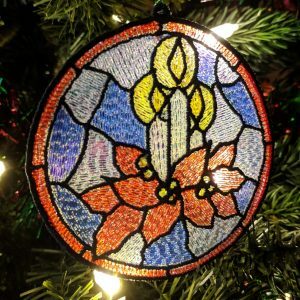 This beautiful ornament combines the sparkle of semi-transparent reflective mylar film with the dimensional appeal of embroidery to create an enchanting stained-glass effect. We’ve included a PDF with complete, step-by-step instructions for stitching and finishing the ornament in the project files. 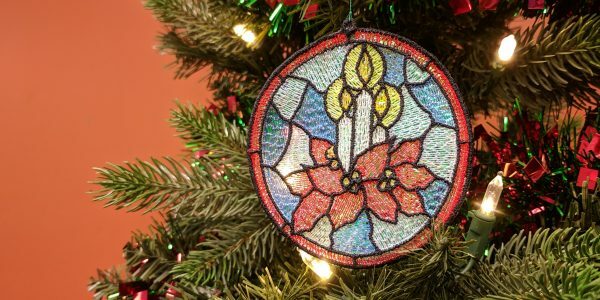 All you’ll need is a small square of mylar material, some fibrous water-soluble stabilizer, and your favorite embroidery thread to create this wonderfully dynamic piece for your tree, garland, or holiday display. From the Embrilliance family to yours, we hope that this gift can add a little shine to your holiday festivities; Use code CSNL2018 for 10% off of any software purchase in the Embrilliance Store throughout the month of November! Get the tools you need, downloaded directly and installed today when you buy direct from Embrilliance! "I am so excited to have learned about your product. It"s been two years since I"ve done any embroidery stitching!! I"ve sent my machine to be cleaned and ready for my embroidery adventures."